Product prices and availability are accurate as of 2019-04-11 20:18:04 EDT and are subject to change. Any price and availability information displayed on http://www.amazon.com/ at the time of purchase will apply to the purchase of this product. A wetting agent that increase coverage and penetration of any herbicide. CONTAINS: 80% non-ionic Surfactant. 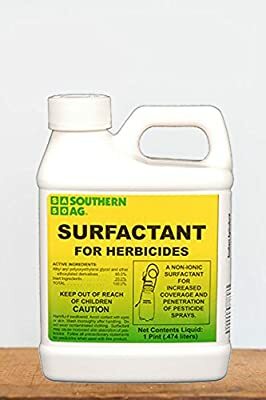 USE: With almost all herbicide sprays including TrimecÆ, Atrazine, Brush Killer and 2, 4-D Amine FOR: Reducing the surface tension of water to insure more uniform coverage and penetration of weed killers. RATE: 1 - 2 teaspoons per gallon of water (1 pint per 100 gallons). INFO and GUIDES Download Label Download Safety Data Sheet (SDS) You will need Adobe Acrobat Reader to view PDF documents. Download a free copy from the Adobe Web site. Size: 16 OZ A wetting agent that increase coverage and penetration of any herbicide. USE: With almost all herbicide sprays including TrimecÆ, Atrazine, Brush Killer and 2, 4-D Amine CONTAINS: 80% non-ionic Surfactant. For large quantity discount consideration or to request a mixed multi-pack, please message us.